NASA’s global precipitation data and data processing systems have come a long way from the launch of TRMM in 1997 to the ongoing GPM mission. Just before midnight Eastern Daylight Time on June 15, 2015, a fireball appeared over central Africa, streaked across Madagascar, and tracked across the uninhabited Southern Indian Ocean. This was the fiery end of the joint NASA/Japan Aerospace Exploration Agency (JAXA) Tropical Rainfall Measuring Mission (TRMM). TRMM’s homecoming after more than 17 years in orbit also marked the end of the first major satellite mission specifically designed to gather data about tropical precipitation and its contributions to global circulation. The data collection started by TRMM continues with the joint NASA/JAXA Global Precipitation Measurement (GPM) mission, which launched in February 2014. From the launch of TRMM in 1997 to the ongoing GPM mission, remotely-sensed hydrometeorological data have evolved greatly. This is a reflection of not only better instrumentation, but also a better understanding of the water cycle and how this cycle interconnects with the energy, carbon, and other cycles driving our planet. 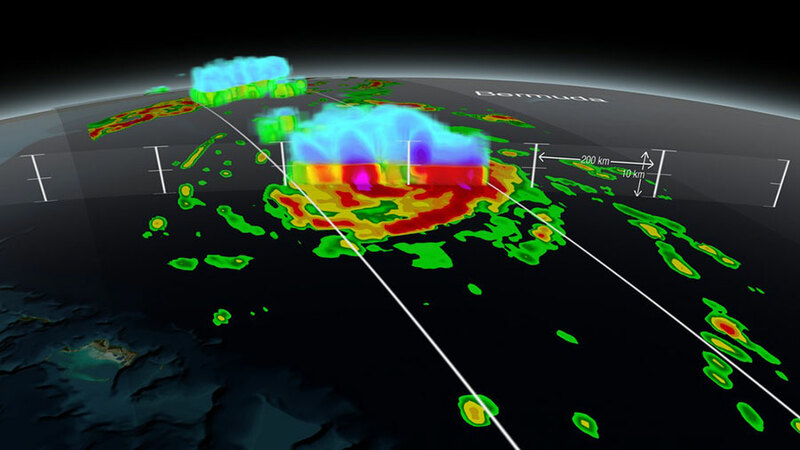 This image of Hurricane Gonzalo approaching Bermuda on October 16, 2014, was created with GPM’s Dual-frequency Precipitation Radar and shows a 3-D view of the storm’s structure. Image courtesy of NASA SVS. If you gathered all of the world’s rain gauges currently in use in one place they would cover an area only about the size of two basketball courts. Since you can’t have a rain gauge or sensor everywhere rain can fall, trying to collect global precipitation data from the ground is an almost impossible task. You need to set your sights higher. Much higher. TRMM collected tropical and subtropical precipitation data from 1997 until 2015. Image courtesy of NASA. The overall objective of TRMM was to use active sensors (a Precipitation Radar, the first of its kind in space) and passive sensors (the Visible and Infrared Scanner [VIRS] and the TRMM Microwave Imager [TMI]) to quantitatively describe tropical rainfall. Along with these three primary instruments, TRMM also carried a Lightning Imaging Sensor (LIS) to observe the distribution and variability of lightning and the Clouds and Earth’s Radiant Energy System (CERES), a broadband scanning radiometer to measure emitted and reflected radiative energy from Earth’s surface and the atmosphere. TRMM data were used to obtain multiyear sets of tropical and subtropical rainfall observations; develop a better understanding of the interactions between sea, air, and land masses and their influence on global rainfall and climate; improve the modeling of tropical rainfall processes; and enhance satellite rainfall measurement techniques. 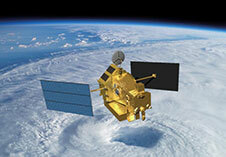 With the success of TRMM, planning for the next precipitation mission, GPM, began in the early 2000s. GPM was developed to provide not only data continuity, but an improvement on the TRMM data. “Scientifically, we’re learning more from GPM because of its advanced instrumentation building off what we learned from TRMM,” says Kirschbaum. The GPM Core Observatory launched in 2014. GPM’s higher-latitude orbital track allows it to monitor storms as they move out of the tropics, and its advanced instrumentation allows it to collect precipitation data ranging from rain to snow and ice. Image courtesy of NASA. GPM improves on TRMM’s capabilities in numerous ways. Although GPM has only two instruments versus the five instruments on TRMM, these two instruments (a Dual-frequency Precipitation Radar [DPR] and a radiometer called GPM Microwave Imager [GMI]) are some of the most advanced ever developed to measure precipitation from space. The DPR is the only dual frequency radar in space, and is capable of creating 3-D profiles and intensity estimates of precipitation ranging from rain to snow and ice. The GMI has a greater frequency range than TRMM’s (13 channels versus 9 channels), which allows GPM to measure precipitation intensity and type through all cloud layers using a wider data swath. One of the most significant evolutions in GPM data is its broader global coverage. While TRMM collected data in tropical and subtropical regions between roughly 35˚ north and south latitude, GPM collects data between approximately 65˚ north and south latitude. This allows GPM’s instruments to collect data on storms as they form in the tropics and move into the middle and high latitudes. Another important GPM data enhancement over TRMM is its design as a Core Observatory that coordinates data collection from a constellation of partner satellites, rather than as a single satellite. The GPM Core Observatory calibrates the data from almost a dozen orbiting U.S. and international satellites that observe precipitation, and helps ensure that the data collected from these satellites has a uniform structure. The number of partner satellites in the constellation will change over time as new satellites are launched and older satellites are decommissioned. “The benefit to the data users is that when you knit all of these data together, it gives you all these looks around the day and you get much finer time resolution,” Huffman says. The greatest legacy of TRMM and GPM is a continuous data record reaching back to the start of the TRMM era in 1998 (the first year for which processed TRMM data products are available). TRMM data originally were processed and archived in the TRMM Science Data and Information System (TSDIS). 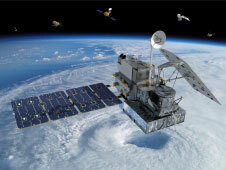 In preparation for the GPM mission, this organization evolved into NASA's Precipitation Processing System (PPS). Located at NASA’s Goddard Space Flight Center in Greenbelt, MD, the PPS processes data from the TRMM and GPM missions as well as data from GPM constellation satellites. These processed data are transferred to the Goddard Earth Sciences Data and Information Services Center (GES DISC) for archiving and distribution. GES DISC is one of NASA's Earth Observing System Data and Information System (EOSDIS) Distributed Active Archive Centers (DAACs) that are responsible for discipline-specific Earth observing data from satellite, airborne, and field campaigns as part of the Earth Science Data Systems (ESDS) Program. Huffman notes that even though TRMM and GPM currently provide nearly 20 years of continuous precipitation data (including the brief period when TRMM and GPM collected data simultaneously), they are two different missions that use different algorithms to produce their data collections—it’s not a simple apples to apples comparison. In order to allow for easier long-term studies using these data and create a more integrated and standardized data collection, the U.S. GPM science team developed the Integrated Multi-satellite Retrievals for GPM (IMERG). A similar system, the Global Satellite Mapping of Precipitation (GSMaP), was developed by JAXA under the sponsorship of the Japan Science and Technology Agency. Tropical Rainfall Measuring Mission (TRMM) was the first step in an evolving process of collecting global precipitation data from space, and helped reveal questions about precipitation measurement that are being addressed by Global Precipitation Measurement (GPM). Huffman, Kirschbaum, and their colleagues already are looking past GPM to see what the next phase in the evolution of this science may be. As Kirschbaum notes, this next phase will continue to rely on space-based platforms. “Having remote perspectives of all of the components of the water cycle is instrumental to understanding not only how our water is circulating, but how this might change in a changing climate,” she says. Kirschbaum also notes that having a multi-satellite view is an important aspect in furthering the exploration of the water cycle and its interconnection with the planet’s other cycles. Several new satellite missions have been launched or are nearing their scheduled launch date that will continue these explorations and complement TRMM and GPM data. These include NASA’s recently-launched Soil Moisture Active Passive (SMAP), which collects global soil moisture and freeze/thaw data to help better predict and understand global flood, drought, and other groundwater-related processes; and the upcoming joint NASA/German Research Centre for Geosciences Gravity Recovery and Climate Experiment Follow-on (GRACE-FO), which is scheduled to launch in 2017 to collect data about water movement and storage and how these processes affect Earth’s mass and gravity. Other upcoming missions that will complement TRMM and GPM include the Ice, Cloud,and land Elevation Satellite (ICESat-2) and the joint NASA/French Centre national d'études spatiales (cnes)/Canadian Space Agency Surface Water and Ocean Topography (SWOT) mission, which are scheduled for launch in 2017 and 2020, respectively.